When putting into place plans for the upcoming year, settling budgets and expectations of how things will work out, organizational leaders must focus on resources. For NISO, the largest part of those resources comes from our members. And while the overwhelming majority of our members are stable and committed to participating in our community--92% of our member companies renew--each year someone informs us of their decision not to renew, which always comes as a great surprise. Several years ago around this time I received an email from the president of a member company, who had decided not to renew participation as a voting member for the upcoming year. Oddly enough, in the footer of this person's message was a statement about the company's conformance with standards. As I always do, I arranged a call to discuss the situation. 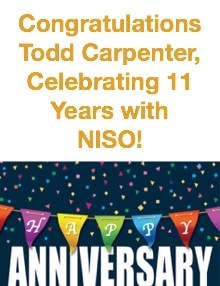 In making the case for the company to remain a member of NISO, I raised the fact that the person's footer proclaimed support for and conformance with standards. The president proclaimed boldly that his "entire business was based on standards" and that his "entire business relied on standards to function." It seemed incongruous to exhibit the company's "support" by withdrawing from the one body that undertook the development and maintenance of the standards his business relied upon, even though no members of his company's staff were participating in NISO projects just then. I then asked if there were problems or challenges that his company faced with the standards it was using. "Of course," was his reply. So I proceeded to inquire whether NISO could do anything about addressing those problems, and told him how to get projects moving forward to improve the state of our community. By the end of the conversation, the company had changed its mind about leaving NISO, and we worked on improving the issue it had faced. Participation in standards development represents cost to an organization: both a direct cost in the terms of membership fees that support the overall effort, and also an indirect cost in terms of the staff time that is needed to advance work. Some organizations pick up only a portion of those costs by allowing staff to volunteer for efforts or working toward adoption in the community outside of the formal development process. Each of these contributions is welcome, of course, and supports the broader goals of improving interoperability and efficiency in our community. However, every organization needs resources, and standards development is not a cost-free activity. This isn't normally the space where I discuss the business case for standards, but as each of you assembles your budget plans for the coming year, please take a moment to consider the benefits your institution sees from NISO's work, and whether your organization could even function without the standards that we support. In all likelihood, running your business would be significantly more time-consuming, costlier, or even impossible without the identifiers, the metadata, the content models, or the processes that NISO has standardized or provided input for standardization. If you think about it, there may be ways that these forms or processes could be improved that would save your organization some high multiple of the NISO membership fee. Participation and membership in NISO might not be as obvious a bottom-line contributor as other investments, but when standards don't exist or compliance is lacking, the costs can be significant. Earlier this year, one executive told me the story of a six-figure sale that was lost because the vendor and subscriber systems weren't correctly sharing data, which depressed usage so much that the subscribing institution decided the cost of continuing the subscription wasn't worth the investment and cancelled it. In reality, the problem wasn't that users didn't want the content, but that they weren't exposed to it because interoperability had failed. Now that organization needs to work even harder to get that customer back, and consequently the executive team has a better understanding of the value of standards. Are there situations in your organization where a failure of standards or interoperability could lead to significant losses or wasted resources? I'm sure you can think of problems where this is the case. Now consider how NISO can support your organization and your team in ensuring you don't face those problems. NISO can help you. Let's talk about how that can happen. NISO's educational events in the month of August include a webinar looking at the lending of hotspots to those in under-served communities as well as a virtual conference looking at the role of the academic library with regard to research information management systems. But don't forget to check out what's coming up in September and October! This 90-minute session will look at current activities by public library systems that are attempting to extend Internet access to underserved communities and households. Many public library systems-both large and small-are experimenting with the loan of Wi-Fi hotspots. What have been the outcomes of such initiatives? How might libraries-whether in urban or rural environments-better support patron needs for access to the Internet in a world where the assumption is that everyone is mobile and constantly online? For speaker abstracts, see the NISO event page. Note: Institutions that belong to the NISO Library Standards Alliance (LSA) automatically receive access credentials for this webinar as a benefit of their membership. Many in the academic community have heard about research information systems (RIS); these are increasingly sophisticated systems that capture various data surrounding the funding, workflow and final output of the research process for purposes of analysis and assessment. The next phase of development for RIS is to network researchers in the interest of building strategic research initiatives and effective collaborations. This conference will look at the vision for and the progress being made in various initiatives. How might research information systems become more tightly integrated with workflow applications? The data captured in an RIS system is significant and should drive increased functionality and accruing value. The event will spotlight entities that foster-through the development of resources or networks-the ability of researchers to identify and connect with collaborators for their work. For more information, please visit the NISO event page. Digital literacy. Data literacy. Those are just buzz phrases. Or are they? What degree of expertise should students and faculty have in order to effectively wrangle data and/or work with digital assets? What are the basic requirements in the modern workplace or laboratory? It's no longer a question of mastering word processing or spreadsheets. Whether it is data science or digital humanities, what enables us, what qualifies us to work with digital assets? And how do we know? The second portion of this two-part event is scheduled for September 20, 2017. Having identified gaps in understanding, this follow-up segment will feature case studies from those institutions that have assumed leadership roles in training students and faculty in emerging tools and methodologies for working with digital materials and generating new digital assets. Jo Angela Oehrli, Learning Librarian, Children's Literature Librarian, University of Michigan Libraries; others TBA. Rick Luce, Dean, University Libraries, University of Oklahoma; others TBA. This video is of a recent day-long event exploring the value of digital collections. Key note speakers were historian and digital history advocate Edward Ayers and Paul Ford, a co-founder of digital product studio Postlight. Rosa, Craveiro, and Domingues describe software used by 11 open source projects for digital preservation, examining areas such as supported standards and protocols, preservation strategies, reporting methodologies, development, and licensing. Institutional websites must be accessible to users with disabilities, not only to meet federal regulations, but also to open content to as wide a community as possible, explain Ng and Schofield. This paper describes broad best practices and also goes into detail on specifics such as markup, fonts, color contrast, and the use of media. "The current system of green open access lacks effective or uniform processes and stipulations, thus delaying and inhibiting the rights that publishers claim they give back to authors of academic journal articles. As a result, authors are turning to alternate sources to share and access journal articles. These social media or file sharing sources operate outside of copyright." Sterman offers ways in which librarians can work with publishers to eliminate these inefficiencies. Huston's wrap-up closes a series of entries he wrote for APNIC over the course of the Internet Engineering Task Force's 99th meeting, which took place in Prague from July 16-22, 2017. Cisco sent participants too, who reported on the event's hackathon. Elsevier announced today that it had acquired institutional repository provider bepress. Commenting in the Scholarly Kitchen, ITHAKA S&R's Schonfeld says, "In a move is entirely consistent with its strategy to pivot beyond content licensing to preprints, analytics, workflow, and decision-support, Elsevier is now a major if not the foremost single player in the institutional repository landscape." The RDF Data Shapes Working Group has published Shapes Constraint Language (SHACL) as a W3C Recommendation. This document defines the SHACL Shapes Constraint Language, a language for validating RDF graphs against a set of conditions. DAISY's just-released Annual Report for 2016 includes a look back at the year in accessible publishing. The declaration released by the Group of Twenty (G20) after its July 7-8 meeting in Hamburg, Germany, states that G20 economies will "encourage the development and use of market- and industry-led international standards...that are based on the principles of openness, transparency and consensus." This International Standard specifies the planning issues, requirements and procedures for the conversion and/or migration of digital records (which includes digital objects plus metadata) in order to preserve the authenticity, reliability, integrity and usability of such records as evidence of business transactions. These digital records can be active or residing in a repository. This ballot closes on August 24, 2017. This International Standard establishes the specifications for the International Standard Collection Identifier (ISCI) as a unique international identification system for each collection, fonds and (archival) series, and part(s) of collections, fonds and series. This International Standard establishes the specifications for the structure of an identifier and promotes the use of the identifier with regard to identifying systems that already exist. It also gives a list of recommended metadata elements that describe a collection. This ballot closes on August 25, 2017. This International Standard specifies the syntax, description and resolution functional components of the digital object identifier system, and the general principles for the creation, registration and administration of DOI names (where DOI is an acronym for "digital object identifier"). This International Standard defines the syntax for a DOI name, which is used for the identification of an object of any material form (digital or physical) or an abstraction (such as a textual work) where there is a functional need to distinguish it from other objects. This ballot closes on August 28, 2017.